This is Christian DVD sets an example to all of us with Tony Melendez’ story. Since he is the man with no arms he automatically suffered many difficulties as he couldn’t do things the same way as people who do have arms but what I love about his story is that he didn’t give up. The story presented in this documentary gives us awareness to be grateful for what we have and to not let the obstacles of life stop us from achieving what we are meant to do. 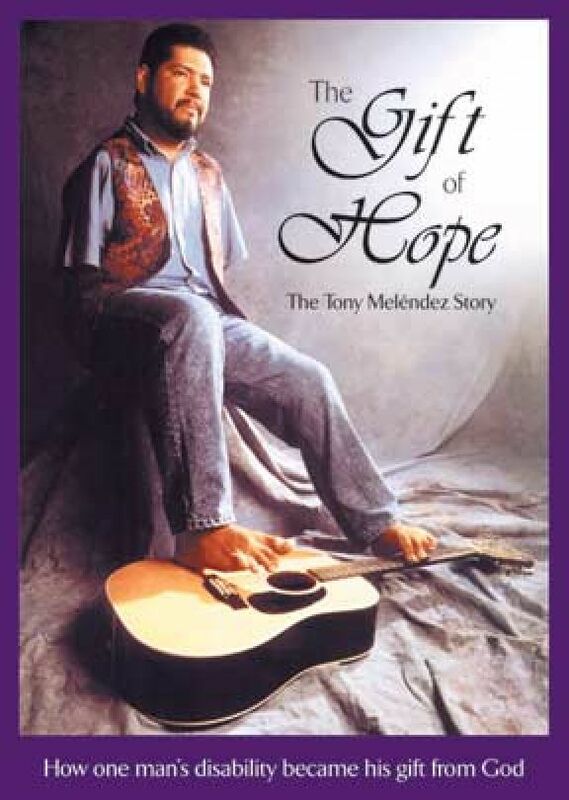 The Gift of Hope: The Tony Melendez Story is about a man who was born without his arms and how he continued on despite the difficulties and learned how to play guitar with his feet. Tony Melendez was born in 1962 with the defect of not having arms. During her pregnancy, Tony’s mom took the prescription drug Thalidomide which had some serious side effects. Tony was just like everybody else but he had to look at life differently and do things differently. He did not want to let his disability take him down, he wanted to go forward. Growing up he could not participate in regular activities which made him feel bad somehow and it’s a normal reaction but he didn’t let that stop him. When Tony was a child, he always had an interest towards music but he was constantly reminded of how he would never get a chance to play an instrument due to his lack of arms. But this didn’t stop Tony, he decided not to listen to the negative comments and decided to try it for himself. So he began teaching himself how to play guitar with his feet and toes, which in fact I can imagine is extremely difficult. So to look how he naturally played the guitar with his toes shows his perseverance and that his disability didn’t have a hold on him. Later on in this Christian DVD, we see how in 1985 Tony started playing guitar and singing which was something that he really enjoyed doing. How did he play guitar if he didn’t have arms, you ask? He played guitar with his feet and developed that ability. Two years later, Tony had the opportunity to play guitar with his feet for Pope John Paul II and he played the song “Never Be the Same”. This was a big deal and it was a special performance. The Pope was very glad with his performance and encouraged Tony to continue on with his singing and talent, this way continuing to give people hope. This performance for the Pope made Tony a household name and it began his journey. Surely as the Pope said, this motivated Tony to continue on this musical journey and his testimony continued to impact lives all around the world. Tony was known for enjoying life and staying positive even though he was very aware of his present circumstances. Tony from The Gift of Hope: The Tony Melendez Story, wanted to do more than just sing and play guitar. He wanted to inspire others and tell his testimony about overcoming difficult challenges. Melendez began speaking to teens and young people about the horrible effect that drug abuse brings. He explains how his life is a true example of that as his mother overused a specific drug and took away basically his chance to have upper limbs. But that even though he didn’t have arms, he continued his life and didn’t let hate or bitterness take the best of him. He obtained peace and joy instead. He knows that there will always be people that will make fun of him or ridicule him but he isn’t sensitive about the topic. He continued to spread the message about how important it is to encourage one another and how it is good for a great development of self-esteem. Tony from the Christian DVD The Gift of Hope: The Tony Melendez Story also reassured that people with disabilities just want to be treated normally. That they want to be treated like everyone else. I think the lesson offered in the Christian movie The Gift of Hope: The Tony Melendez Story is so important and inspiring. Check out this Christian DVD at the Fishflix store!